Snowdonia National Park stretches some 823 square miles through mountainous terrain, picture-postcard villages in the remotest of settings, legendary lakes and the almighty peak that is Mount Snowdon. Despite this, seeing Snowdonia by train is easier than you might think! Blaenau Ffestiniog was once the ‘slate capital of the world’. This heritage mining town is at the very heart of Snowdonia National Park. And it is respectfully yet excitedly shaking off the hardship of its defunct industry. For today it is a hub for adrenaline-fuelled activities. While the Victorian Mine Tour through the slate caverns continue, appealing to younger generations are the zip wires and trampoline centres that have made some of these caverns a cool home. Up on the slippery slate hillsides don’t be surprised by a blur of mountain bikers putting their wheels and their nerves to the test. 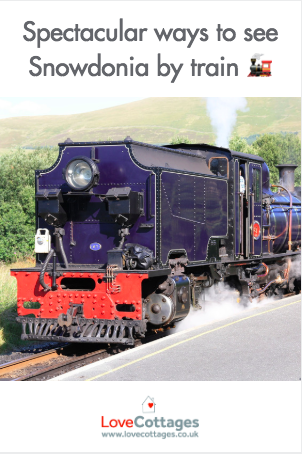 Blaenau Ffestiniog is also home to the Ffestiniog and Welsh Highland Railways. Whether you’re day-tripping or travelling through Snowdonia by train, this 40-mile steam train journey is a stunning way to discover the park and beyond. The track winds through the valleys and past the lakes of the park, stopping upon request at remote village stations and the foot of Snowdon before arriving in Caernarfon. Tanygrisiau for a visit to the hydro-electric power station. Tan y Bwlch for nature trails and lake walks. Plas Halt is close to Plan Tan y Bwlch, which was once the seat of quarry owners the Oakley family and has beautiful gardens. 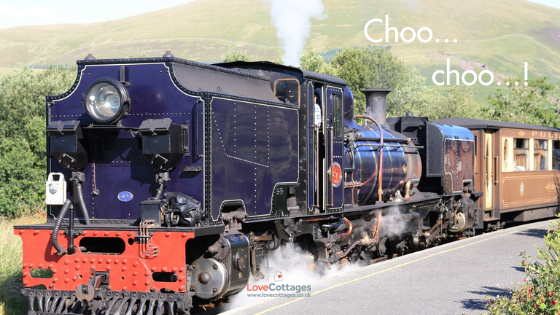 It’s the perfect point to pick up the train from one of our pretty Maentwrog holiday cottages. Penrhyn is a request stop on the edge of the park. While the former station is now a volunteer-run hostel, nearby Penrhyndeudraeth packs in the lush park backdrop. At Minffordd pick up the Cambrian Coast Line for onward journeys or enjoy easy access (by foot, four wheels or two) to iconic Portmeirion. Steaming into Porthmadog you’ve reached the shoreline and can continue northwards on the Welsh Highland Railway. Stay a while in one of our Morfa Bychan holiday cottages on the outskirts of town for an enviable rural spot between country and sea. Three stops on and you’re back in the serenity of mountain country. Stay in Beddgelert in a riverside cottage with the dramatic ridge lines rising all around. Many Wales walking holidays start here and there’s no shortage of hill training! If climbing Snowdon is on your bucket list, alight at Rhyd Ddu and take the path of the same name to the summit. Alternatively just enjoy the epic views! If you fancy making it at least some of the way up Snowdon, the Snowdon Mountain Ranger is an alternative train option and easily accessible from our Caeathro holiday cottages between Caernarfon and Llanberis. And if the the beaches of the Llyn Peninsula tease you venture further beyond the park, a 7 minute train journey from Porthmadog brings you to Criccieth. A hotchpotch of history greets you here, if you care to look. An essentially Victorian seaside town resting on a more fought-for history signalled only by the medieval castle and a headland fortress, which divides the town’s two beautiful beaches. What?! Leave the car at home? No, we haven’t gone mad. If you can’t bear the thought of driving or actually just fancy the idea of a no-drive holiday, then Snowdonia holidays are still doable. In under 3 hours you can get from Birmingham to Aberdovey in the south-west corner of Snowdonia National Park, from Liverpool or Manchester in under four. And if you’re heading to the northern activity capital of Snowdonia, Betws-y-Coed, it’s 3.5 hours from Birmingham and just over 4 hours from London. Snowdonia is one HUGE playground! From its northern coastal reaches at Conwy, its eastern edge at Bala, southwards to Machynlleth, and on to Harlech in the west, we challenge you to take on Snowdonia! This is no mountain climbing gauntlet. There are few straight edges (or roads for that matter). But best of all there are spectacles galore. Shall we go explore?